Chemical processes in the troposphere are driven by a combination of factors. Emissions from the Earth’s surface, either natural or anthropogenic, are the primary source of trace gases in the troposphere. The energy driving many chemical reactions is derived from the Sun, hence the reactions are “photochemical”. Transport processes can distribute longer-lived trace gases to locations remote from their origin. In this article, Dr Anna Jones, from the British Antarctic Survey, describes some of the highly surprising phenomena that have been discovered in the polar troposphere over the past twenty years. An appropriate starting point is to consider what the polar regions are like, and to contrast the North Pole with the South Pole. Antarctica is a snow-covered continent, surrounded by the Southern Ocean and remote from major population centres. The overlying troposphere is therefore one of the cleanest parts of the Earth’s troposphere, and is perturbed only by very long-lived pollutants such as CO2 and methane. The Arctic contrasts somewhat, in that it comprises a polar ocean (ice-covered during the majority of the year) that is surrounded by continents (snow-covered to a greater or lesser extent). There are parts of the Arctic that are also remote and clean, but equally, there are areas that are exposed to pollutants, a well known example being Arctic Haze. From this background, what was the polar troposphere expected to be like? The general a priori view was that the polar troposphere would be chemically fairly uninteresting, with low mixing ratios of the reactive trace gases like OH, HO2, NO and NO2. The snow was considered to be important because of its albedo effect (which indeed it is), but that otherwise it would merely act as a cap to emissions from land and ocean surfaces below. Atmospheric chemists, who want to understand atmospheric composition and processes throughout the Earth’s atmosphere, were nonetheless motivated to study there. The polar troposphere is unusual for a number of reasons: it is very cold; during winter it remains dark for up to 24 hours per day, and during summer the reverse situation occurs with extended hours of daylight. It therefore provides a good testing ground for numerical models of the atmosphere. Furthermore, the polar troposphere (in particular over Antarctica) is one of few remaining parts of the atmosphere that are genuinely clean, providing an opportunity to study a natural background atmosphere. Finally, of course, the polar troposphere makes up a significant part of the atmosphere, so we really ought to know what it is like. What was found was by no means what was expected. Here I will report on two of the real surprises held by the polar troposphere. Most people will have heard about atmospheric ozone in the context of the stratosphere. However, ozone is also present in the troposphere, in much smaller amounts, but nonetheless important; it is involved in production of OH which is the most reactive radical in the atmosphere, responsible in large part for the removal of long-lived (including pollutant) trace gases. In the polar regions, it was assumed that surface ozone would have a simple seasonal cycle. A minimum in the summer was anticipated, resulting from destruction by photochemically-driven reactions; conversely, during winter, with photochemistry effectively switched off, ozone could be transported into the polar regions by the general movement of the atmosphere resulting in an annual maximum. And indeed, there are places, such as the South African base, Sanae, situated 170km inland from the coast of Antarctica, where such a seasonal cycle is observed. But it has turned out that there are significant deviations from this cycle observed elsewhere. The first hint of something unusual came from measurements made at Alert, on the northern tip of Nunavut, Canada. Measurements were made during springtime, soon after the sun had risen from the winter darkness. Initially ozone concentrations were in line with what was expected, roughly 30 parts per billion by volume (ppbv). But then strange features were observed: ozone concentrations dropped suddenly to around instrumental detection limits of only a few ppbv; they remained low for a day or so, and then recovered to more normal amounts. These features were observed on several occasions during that first springtime study at Alert. The first question then was – are these features real, or is there an artefact in the measurements? Further measurements made in the Arctic during subsequent springtimes revealed the same features, showing that this was a real atmospheric phenomenon. Given that these measurements were made in the Arctic, which can be subject to anthropogenic pollutants, the next question was – are these natural or man-made effects on ozone levels? 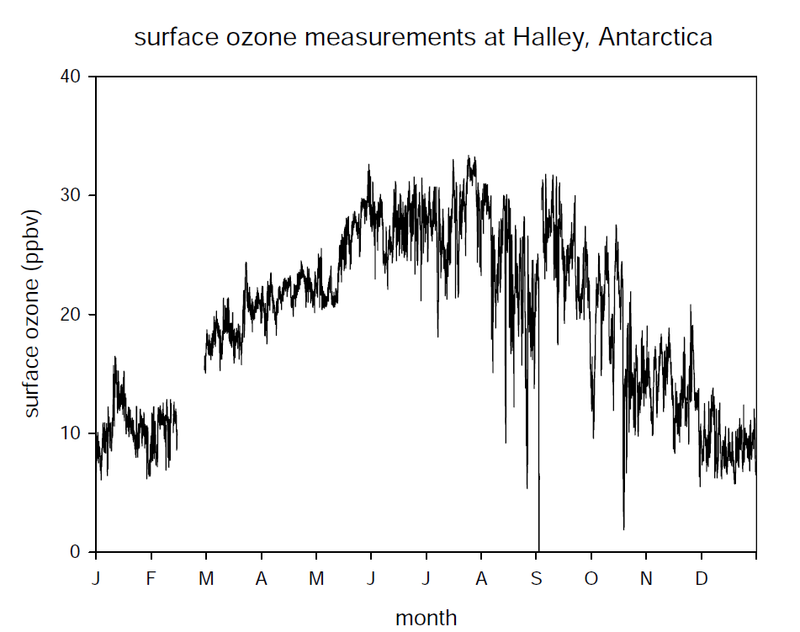 The answer lay in Antarctic measurements, which showed that these features of rapid ozone loss, now known as Ozone Depletion Events (ODEs) were also measured at research stations in coastal Antarctica (see Figure 1). These data confirmed that ODEs were a natural phenomenon. Ongoing research in both polar regions progressively built the now familiar picture of ODEs. They occur only during the spring; sometimes ozone concentrations drop from normal amounts to near-zero within the space of a few minutes; sometimes ozone loss can be less complete, and can occur more gradually; ozone can remain suppressed for several days; vertical profiling using balloons has shown that the ozone loss can extend up to ~1500 m in altitude and that they are contained within the planetary boundary layer by a capping inversion. An important observation was that ODEs are associated with transport of air masses over sea ice. 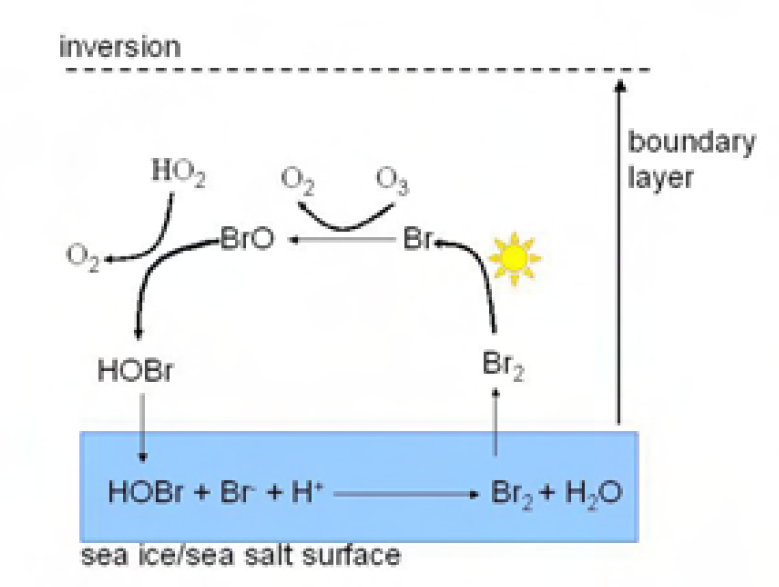 ​The mechanism that is driving surface ozone loss is known as the “Bromine Explosion”, and is autocatalytic in bromine in the sense that one gaseous bromine going into the system results in two gas-phase bromines coming out (Figure 2). Bromide is liberated from the quasi-liquid layer on some sort of sea ice surface (exactly which is still open to debate). The possible candidates include sea salt aerosol, sea salt deposited onto the snowpack, or frost flowers – delicate dendritic ice crystals which are highly saline and grow as new sea ice forms. Interestingly, elevated BrO has also been measured in other locations where large areas of exposed salt exist, such as salt pans and the Dead Sea. ODEs have been significant for atmospheric chemists for a number of reasons. They highlighted new reaction pathways that are important for halogen chemistry in the boundary layer. They have a potential radiative role that could be relevant on a regional scale, if air that is low in ozone is mixed to higher altitudes where ozone is particularly radiatively important. Finally, they were completely unanticipated, and so provide a nice example that the natural world still holds surprises for us! As outlined above, our initial view of the polar troposphere was that it would be relatively uninteresting from a chemical point of view. Low mixing ratios of the reactive trace gases such as OH, HO2, NO, NO2 were expected, and the snow was anticipated to be important for albedo and as a barrier to surface exchange; it was not anticipated to be chemically active. The assumption that snow is a chemically-inert substrate has since been turned completely on its head. In order to explore the new subject of snow photochemistry, I will describe the story of NOx production from snow. In the 1990s, a group of atmospheric scientists were working at Summit, Greenland. They had instrumentation to make an integrated measurement of all oxidised nitrogen trace gases referred to as NOy, (= NO + NO2 + HNO3 + HONO + …. ), as well as NOx (= NO + NO2). Given that NOx has relatively few natural sources, the majority in the present-day troposphere being anthropogenic, the scientists were anticipating low mixing ratios of NOx and a lot more NOy. What they found were extraordinarily high mixing ratios of NOx, and a high ratio of NOx to NOy, suggesting that there had to be a highly significant local source of NOx. They turned their attention to the snow. Snow is not a solid medium, but is porous to a greater or lesser extent. The instruments measuring NOy and NOx sucked their air sample through a piece of Teflon tubing. The tubing was now inserted into the snowpack to allow the scientists to sample the interstitial air and to compare it with ambient. 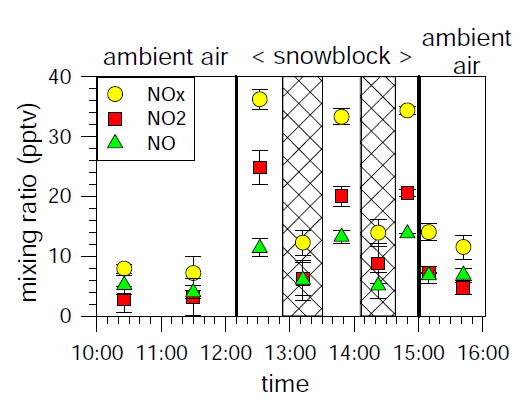 What they found was quite astonishing: both NOy and NOx that was sampled from within the snow was present at mixing ratios many times higher than in the ambient air. There appeared to be a major source of NOx from within the snowpack. The scientists measured for roughly 1½ days, and found that their results were robust throughout this time period. They also found a signal of a diurnal variation, and suggested that this was due to variation in the amount of solar radiation reaching the snow surface. I heard about this research at the American Geophysical Union conference in December 1996. A month later I travelled to Antarctica as part of a collaborative project between the British Antarctic Survey and the German Alfred Wegener Institute for Polar and Marine Research to study oxidised nitrogen chemistry. The fieldwork was carried out at the German research station, Neumayer, using instrumentation to measure NOy, NO, and NO2. We decided to try to replicate the Greenland work to see if these processes operated in Antarctica, and also to try to quantify the production of these species. We found that ambient air was processed as it passed through the snow, and that both NO and NO2 were produced. The diurnal variation was also present, and we tested to see if this was driven by changing solar radiation or by temperature; it was the former (Figure 3 and Figure 4). So, an extremely interesting new phenomenon had been found in both polar regions, but to have an influence on the atmosphere, the NOx had to be emitted from the snowpack and into the overlying boundary layer. For three days at Neumayer we measured gradients of NOx above the snowpack, and using coincident meteorological data, calculated fluxes of NOx out of the snow. So, NOx was both being produced within the snowpack and being released into the overlying boundary layer. It was highly significant to find a local source of this important trace gas in these remote locations. Production of NOx from snow has now been measured at every polar location where it has been studied. 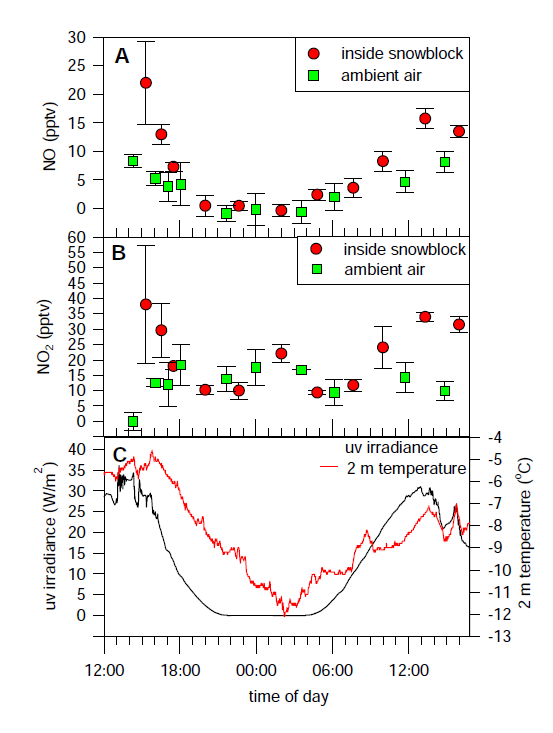 The NOx is produced by the photolysis of nitrate impurities within the snow, and as nitrate is a ubiquitous impurity, this appears to be a process occurring wherever sunlight shines on snow (see Box 1). The effect on the polar troposphere varies considerably with geographical location; at the coastal Antarctic stations, for example, NOx in the boundary layer is present only at low mixing ratios, albeit higher than would occur without emissions from the snowpack. The most extreme case is the South Pole station, where NO mixing ratios are routinely over 500 pptv. The exceedingly high mixing ratios are driven by several factors including a very shallow and stable boundary layer into which emissions are concentrated, high concentrations of nitrate impurities in the top layers of the snowpack, intense solar radiation at such a high elevation (South Pole is at 2830 m above sea level) and the fact that South Pole is downslope of the polar plateau, and therefore receives air that has been exposed to much snow. Normally this suite of reactions is associated with polluted regions, but mixing ratios of NO2 at the South Pole are sufficiently large for in situ production of ozone in the summertime boundary layer. The production of NOx from snow was a case study to illustrate the mechanisms at work, the extent of the phenomenon, and the potential influence on other atmospheric chemistry. Other trace gases, such as HONO, HCHO, and ethene to name just a few, have also been shown to be produced by the action of sunlight on snow. Snow photochemistry and the boundary layer ozone depletion phenomenon described earlier, are both new and exciting areas of science, and have opened a completely new way of thinking about the polar troposphere. Rather than being the chemically uninteresting place that many anticipated, it has turned out to be a fascinating region to study, and full of surprises!